a Universidad de Córdoba, Spain. Many intervention programs are conducted in different countries in order to promote social and emotional learning. Nevertheless, the number of instruments to evaluate these competencies is still low, and core social and emotional competencies are rarely included in a single questionnaire and measured as a single construct. Thus, this study was conducted to design and validate the Social and Emotional Competencies Questionnaire. This instrumental study was conducted with 643 university students and a representative sample of 2,139 adolescents. The results show that the questionnaire has good psychometric properties and includes four components: self-awareness, self-management and motivation, social-awareness and prosocial behavior, and decision-making. These competencies are positively related to perceived emotional intelligence and negatively related to alexithymia. This questionnaire can be useful in evaluating social and emotional competencies in different settings. It can also be used to evaluate the effectiveness of social and emotional learning programs. En diferentes países se llevan a cabo numerosos programas de intervención para promover el aprendizaje socio-emocional. Sin embargo, las principales competencias sociales y emocionales raramente se incluyen en un solo cuestionario o se miden como un único constructo. Por ello, el objetivo de este estudio fue diseñar y validar el Cuestionario de Competencias Socio-Emocionales. Este estudio instrumental se realizó con 643 estudiantes universitarios y con una muestra representativa de 2139 adolescentes. Los resultados mostraron que el cuestionario tiene muy buenas propiedades psicométricas e incluye cuatro componentes: autoconciencia, autogestión, conciencia social y conducta prosocial, y toma de decisiones. Estas competencias están relacionadas positivamente con la inteligencia emocional percibida y negativamente con la alexitimia. Este cuestionario puede ser útil para evaluar las competencias socio-emocionales en diferentes contextos. También puede usarse para evaluar la efectividad de los programas de aprendizaje socio-emocional. Emotional competencies are broadly studied since the ground-breaking research on emotional intelligence started by Mayer and Salovey (1997). These authors defined emotional intelligence as the ability to perceive, express, use and regulate emotions. A recent meta-analysis showed that emotional intelligence is related to subjective well-being in young adults (Sánchez-Álvarez, Extremera, & Fernández-Berrocal, 2016) and a recent systematic review showed its negative relationship to different forms of aggressive behavior in adolescents and adults (García-Sancho, Salguero, & Fernández-Berrocal, 2014). Different social and emotional competencies have been found to enhance positive school climate (Ortega-Ruiz & Zych, 2016), protect children and adolescents from involvement in bullying (Del Rey et al., 2016; Zych, Ortega-Ruiz, & Del Rey, 2015; Zych, Farrington, Llorent, & Ttofi, 2017) and predict social adjustment (Herrera López, Romera Félix, Ortega-Ruiz, & Gómez-Ortiz, 2016) in adolescence. High scores in emotional management were found to be positively related to successful interpersonal relationships in university students (Lopes et al., 2004). Many antisocial and undesirable behaviors share common risk and protective factors (Farrington, 2015). Therefore, some general strategies can be adopted to increase the health and wellbeing of young people (Farrington, Losel, & Ttofi, 2016). Programs to prevent antisocial and undesirable behaviors have been conducted in schools for decades, yet interventions addressing only a specific and isolated risk factor were rarely effective (Catalano et al., 2012). On the other hand, it was suggested that complex programs focusing on various risk and protective factors at the same time -shared by different risky behaviors - were the most effective (Catalano, Berglund, Ryan, Lonczak, & Hawkins, 2004). In the 1990s, a framework called Social and Emotional Learning (SEL) was created with the idea of promoting protective factors such as social and emotional competencies. These programs were intended to decrease different risky behaviors and to promote health and wellbeing in youth. Since then, hundreds of interventions have been conducted within this framework across different countries and across all age groups from early childhood education to higher education (Durlak, Domitrovich, Weissberg, & Gullotta, 2015). A meta-analysis conducted by Durlak, Weissberg, Dymnicki, Taylor, and Schellinger (2011) on school-based universal interventions to promote SEL showed that these programs were effective in improving students' social and emotional skills, academic performance, behaviors and attitudes. This meta-analysis was conducted with 213 programs and 270,034 students from all educational levels. As stated by its authors, the proximal goal of SEL interventions was to promote competencies such as self-awareness, self-management, social awareness, prosocial relationship skills, and responsible decision-making. These competencies are the core SEL competencies as proposed by Collaborative for Academic, Social, and Emotional Learning (CASEL, 2012) one of the leading organizations for SEL promotion which groups researchers, educators and policy makers. These competencies are a crucial part of SEL programs and their detailed description can be found in a recently published handbook (Durlak et al., 2015). According to Durlak et al. (2015), self-awareness is the capacity to pay attention and understand own emotions, goals and values, being able to recognize the relationship between thoughts, feelings and behaviors. Self-management is the ability to manage own emotions and behaviors to facilitate motivation and achievement of own goals. Social-awareness consists of understanding other people, different social contexts and norms. Relationship skills make it possible to initiate and maintain prosocial interpersonal relationships, respecting social norms and having good communication skills. Responsible decision-making includes reflexive considering of different choices taking into account the wellbeing of self and others. Although these competencies have been the main focus of hundreds of SEL programs, specific evaluation instruments that include all of them are very scarce. A thorough review of social and emotional assessment strategies and instruments across all the age groups conducted by Den-ham, Wyatt, Bassett, Echeverria and Knox, (2009) showed that these competencies were usually evaluated separately. According to this review, social competence in adolescents and youth could be evaluated through the Social Skills Rating System - an instrument that includes scales such as cooperation, empathy, assertion, self-control, responsibility, externalizing and internalizing behavior and hyperactivity (Gresham & Elliott, 1992). The Adolescent Multidimensional Social Competence Questionnaire - a new questionnaire designed and validated in adolescents by Gómez-Ortiz, Romera and Ortega-Ruiz (2017) measures different aspects of social competence such as cognitive reappraisal, social adjustment, prosocial behavior, social efficacy and normative adjustment. There are also many different instruments for measuring emotional competence, most of them based on the models of emotional intelligence (Denham et al., 2009). One of these instruments is the Trait Meta-Mood Scale (TMMS), based on the emotional intelligence model developed by Salovey, Mayer, Goldman, Turvey and Palfai (1995). Also, the Toronto Alexithymia Scale (TAS-20; Bagby, Taylor, & Parker, 1994), which measures difficulties in identifying and expressing emotions, was among the suggested instruments. Both questionnaires were validated in Spain; TMMS-24 by Fernández-Berrocal, Extremera and Ramos (2004) and TAS-20 by Páez et al. (1999) and both are used in the current study. In general, the number of specific instruments to measure different social and emotional competencies in the same scale validated in adolescents and young adults is low. These instruments focus on different aspects of emotional competencies, but new instruments that include both social and emotional competencies in adolescents and young adults are still needed. This study was conducted with the objective of designing and validating the Social and Emotional Competencies Questionnaire (SEC-Q) in adolescents and young adults, describing the dimensions of the construct, the psychometric properties of the instrument, and its relationship to similar constructs such as alexithymia and perceived emotional intelligence. The instrument was expected to include competencies such as self-awareness, self-management and motivation, social-awareness and prosocial behavior, and reflexive decision-making. It was expected to show positive relationships with perceived emotional intelligence and negative relationships with alexithymia. The current work was conducted with two different samples. The first sample included 643 university students (University of Córdoba, Spain) with a mean age of 20.79 years (SD = 2.71); 65% women. These students were enrolled in different courses of the Degree in Early Childhood Education, Degree in Primary Education, Degree in Mechanical Engineering and Degree in Informatics. The participants were selected through convenience sampling. A representative sample of secondary education students in Andalusia was used in the second study. These participants were randomly selected using a multi-stage stratified sampling (95% of reliability and a sampling error of 2.1%) taking into account all the provinces of Andalusia, location sizes (small, medium and big cities/towns), and public and private schools. The second study included 2,139 participants (50.9% girls, M age = 13.79 years, SD = 1.40, ranging from 11 to 19) enrolled in 22 schools. Students were enrolled in grade 1 (n = 542), grade 2 (n = 555), grade 3 (n = 529) and grade 4 (n = 508). Social and Emotional Competencies Questionnaire (SEC-Q) was designed for the current study (see appendix 1). The first version of the questionnaire included 50 items with a 5-point Likert scale ranging from 1 (strongly disagree) to 5 (strongly agree). These items were based on literature about social and emotional competencies and learning reviewed and described in the introduction. Ten items for each of the following competencies were designed by a group of experts (see procedure): self-awareness, self-management and motivation, social-awareness, prosocial relationships skills and decision-making. After an Exploratory Factor Analysis, items with loadings on more than one dimension and loadings lower than .30 were eliminated. The final version contains 16 items with an excellent omega (Ω = .87 in the university sample and (Ω = .82 in adolescents). Psychometric properties of this questionnaire are described in the results of the current article. Trait Meta-Mood Scale (Salovey et al., 1995) in its short Spanish version (TMMS-24) validated by Fernández-Berrocal et al. (2004). The questionnaire measures perceived emotional intelligence with 24 items answered on a 5-point Likert response scale ranging from 1 (strongly disagree) to 5 (strongly agree). There are three factors such as Emotional attention (a = .90), Emotional clarity (α = .90) and Emotional repair (α = .86). The Cronbach's alpha values were also excellent for the total scale (α = .87) and the three subscale (.88, .88 and .85, respectively) for the current study. The Toronto Alexithymia Scale (TAS-20; Bagby, Taylor, & Parker, 1994) - Spanish version validated by Páez et al. (1999). Two subscales of the instrument were included in the current study: Difficulty in describing feelings with 5 items (Cronbach's alphas in the Spanish version between .75 and .82) and Difficulty in identifying feelings with seven items (Cronbach's alphas in the Spanish version were between .70 and .82). These items are answered on a five-point Likert scale ranging from 1 (strongly disagree) to 5 (strongly agree). The Cronbach's alpha value obtained in the current study for Difficulty in identifying feelings was .85 and .72 for Difficulty in describing feelings. This was a cross-sectional instrumental study conducted by means of a survey (Montero & Leon, 2007). The first version of the Social and Emotional Competencies Questionnaire was designed by three experts, senior researchers in the field. Items were based on a thorough review of literature related to social and emotional learning and core social and emotional competencies such as self-awareness, self-management and motivation, social awareness, prosocial relationship skills and responsible decision-making. Ten items per dimension were produced and a pilot study with 168 participants selected by convenience and a snowball sampling was conducted (unpublished) in which participants were asked to answer the questionnaire and give feedback regarding its items. Item reduction based on the results of the statistical analyses was performed (see data analysis). The survey was filled in by the participants during their regular classroom hours (about 20 minutes) under the supervision of the researchers. The survey was anonymous and the participants were informed that they had the right to refuse to participate or to withdraw from the study at any moment. In the first sample (young adults) all the participants filled in the survey and none of them refused to participate or withdrew from the study. In the second sample (adolescents) 15 participants decided to withdraw. The procedure followed all the requirements of the national and international legislation for studies with humans and was approved by the Ethics Committee of the University of Córdoba. Both samples (young adults and adolescents) were divided into two sub-samples each. Each sub-sample included about 50% of randomly selected cases. One sub-sample in each sample was used to perform an Exploratory Factor Analysis and the other sub-sample in each sample was used to perform a Confirmatory Factor Analysis. Descriptive statistics and frequencies, together with correlations, percentiles, gender differences and the results of the Exploratory Factor Analysis were calculated with FACTOR software. According to the current recommendations for factor analyses (Lloret-Segura, Ferreres-Traver, Hernández-Baeza, & Tomás-Marco, 2014; Matsunaga, 2010) the Exploratory Factor Analyses were conducted through Unweighted Least Squares, with parallel analysis, Promax rotation and polychoric correlation matrix. Reliability was tested with the McDonald's omega and standardized alpha. Means, standard deviations, skewness, kurtosis, commonalities and explained variance were also calculated. Items with loadings on more than one factor and items with loadings lower than .30 found in the first Exploratory Factor Analysis (50% of the young adults) were eliminated. PASW-Statistics 18 software was used to calculate percentiles (10, 20, 30, 40, 50, 60, 70, 80, and 90) of the total score and for each subscale of the questionnaire. Concurrent validity was studied in the first sample (young adults) with Pearson correlations. Gender differences were tested with the Student's t-test and the effect sizes - Cohen's d and confidence intervals - were calculated with the Campbell Effect Size Calculator. Confirmatory Factor Analyses were conducted with EQS 6.2 software with maximum likelihood, robust method using polychoric correlations because of the ordinal response scale. A combination of different indices was used to test the model fit, as recommended by different authors (Bentler, 1990; Vieira, 2011). Arbuckle (2012) suggested that an adequate fit can be tested by RMSEA below .08, NFI above .95, CFI and TLI close to 1 and RMR close to 0. Browne and Cudek (1993) suggested that a model has an adequate fit if the RMSEA is below .08 and Bentler (1990) recommended a CFI value above .95 for a good fit. Sub-samples of about 50% of the participants in each sample (university students n = 302 and adolescents n = 1093) were selected for the Exploratory Factor Analyses. Kaiser-Meyer-Olkin test showed sampling adequacy (young adults KMO = .80 and adolescents KMO = .83) and therefore, two factor analyses (one with young adults and one with adolescents) with promax rotation were performed. Factor loadings, means, standard deviations, kurtosis, skewness and communalities are shown in Table 1. These results show good psychometric properties of the questionnaire. Table 1 Results of the Factor Analysis, Means, Standard Deviations, Skewness, Kurtosis and Communalities of the Social and Emotional Competencies Questionnaire. The first component, Self-awareness explained 34.77% of the variance in young adults and 25.25% of the variance in adolescents, and showed very good reliability (young adults Ω = .83, α = .83; adolescents Ω = .73, α = .73). The second component - Self-management and motivation explained 10.44% of the variance in young adults and 9.43% of variance in adolescents, also with adequate reliability (young adults Ω = .81, α = .79; adolescents Ω = .67, α = .65). Social-awareness and prosocial behavior explained 9.05% of the variance in young adults and 8.48% of the variance in adolescents and showed good reliability (young adults Ω = .78, α = .77; adolescents Ω = .74, α = .73). Decision-making explained 8.55% of the variance in young adults and 7.64% of the variance in adolescents, with good reliability (young adults Ω = .77, α = .75; adolescents Ω = .77, α = .77). These four factors explained 62.82% of the variance in young adults and 50.80% of the variance in adolescents and the reliability of the whole scale was very good (young adults Ω = .87, α = .87; adolescents Ω = .80, α = .80). Confirmatory Factor Analyses were performed with the second sub-samples (young adults: n = 341; adolescents: n = 1046) of participants. The four-factor structure was confirmed showing very good fit to the data in both, young adults and adolescents (see Figure 1). Young adults: SB Chi-square = 126.31, df = 98, p < .01; NFI = .95; NNFI = .99; CFI = .99; RMSEA = .030 (90%CI = .010 to .044); Adolescents: SB Chi-square = 190.85, df = 98, p < .01; NFI = .95; NNFI = .97; CFI = .98; RMSEA = .032 (90%CI = .025 to .039). Values on the left - young adults, and values on the right - adolescents. Comparison of the mean scores between men and women including the whole sample of young adults (N = 643) showed no gender differences in Self-awareness, Self-management and motivation and Decision-making. On the other hand, women scored higher than men in Social-awareness and prosocial behavior (M = 24.27, SD = 2.77 vs. M = 23.01, SD = 3.47; t (362 70) = 4.61, p < .01; d = .42, 95°% CI = .25 to .59), and the total score in SEC-Q (M = 62.54, SD = 6.78 vs. M = 60.56, DT = 8.15; t (364.06) = 3.02, p < .01; d = .27, 95% Cl = .10 to .44). Comparison of the mean scores between girls and boys including the whole sample of adolescents (N = 2139) showed that there were no significant gender differences in Self-awareness. Boys scored higher than girls in Self-management and motivation (M = 12.29, SD = 2.35 vs. M = 12.01, SD = 2.42; t (2044)= 2.66, p = .01; d = .12, 95% Cl = .03 to .20). Girls scored higher than boys in Social-awareness and prosocial behavior (M = 24.20, SD = 3.13 vs. M = 23.24, SD = 3.56; t (1915.54)= 6.38; d = .29, 95% Cl = .20 to .38), Decision-making (M = 10.78, SD = 2.70 vs. M = 10.52, SD = 2.82; t (2070) = 2.17; d = .09, 95% Cl = .01 to .18) and in the total score (M = 63.26, SD = 7.52 vs. M = 61.97, SD = 8.08; t (1853) = 3.58, d = .17, 95% Cl = .07 to .26). Percentiles for each scale and the total score are shown in Table 2. Table 2 Percentiles for each Subscale and the Total Score of the Social and Emotional Competencies Questionnaire. Concurrent validity was studied in the sample of young adults by calculating correlations among the total score and the subscales of the SEC-Q with Difficulties in describing and Identifying feelings, and with perceived emotional intelligence. As shown in the Table 3, there were negative significant correlations among most of the subscales of SEC-Q with Difficulties in describing and Difficulties in identifying feelings and positive significant correlations with the subscales and the total score in perceived emotional intelligence. 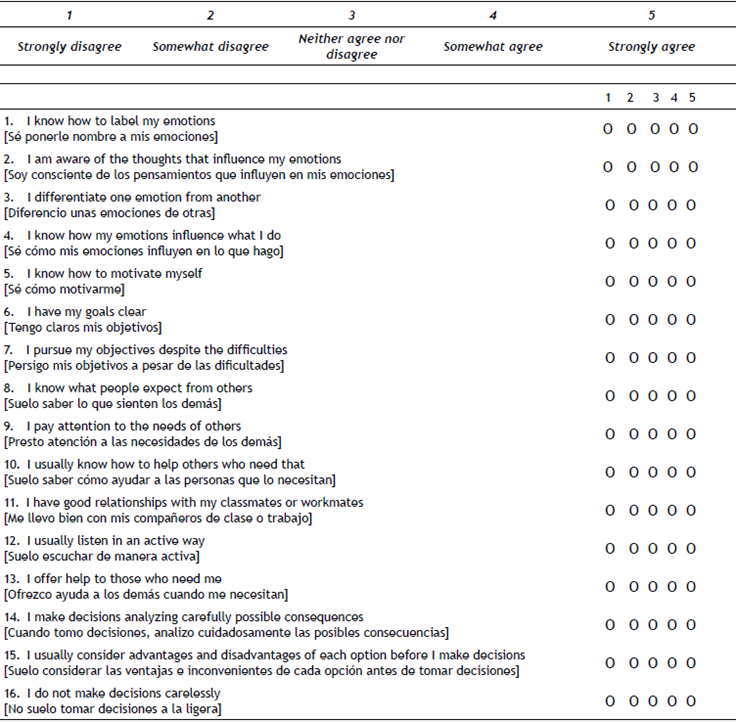 Table 3 Relationships between the Scales of the Social and Emotional Competencies Questionnaire with Difficulties in Identifying and Expressing Feelings and Perceived Emotional Intelligence. Social and emotional competencies are broadly studied since the 1990s and programs for their promotion are now being conducted on a large scale in different educational levels (Durlak et al., 2015). These programs were found to be effective in improving SEL skills, attitudes, positive social behavior, conduct problems, emotional distress and academic performance (Durlak et al., 2011). Even though many of these programs include core competencies such as self-awareness, self-management, social-awareness, prosocial relationship skills and responsible decision-making (CASEL, 2012), these competencies are usually measured separately by different instruments and without calculating the total score in the construct (Denham et al., 2009). Thus, the objective of this study was to develop and validate the Social and Emotional Competencies Questionnaire (SEC-Q) in young adults and adolescents. This scale includes all these competencies in a single instrument. The results of this study showed that SEC-Q had good psychometric properties found through Exploratory and Confirmatory Factor Analyses in young adults and in adolescents. The instrument includes four scales (self-awareness, self-awareness and motivation, social-awareness and prosocial behavior, and responsible decision-making). This structure represents the core competencies of the SEL programs (Durlak et al., 2015). In this questionnaire, social awareness and prosocial relationship skills were grouped in a single dimension that was labeled social awareness and prosocial behavior. Because these competencies are very similar in nature, it seems logical that they were found to measure a single underlying construct. In general, the dimensions found in this study fit the theoretical background described in the introduction. In young adults, women were found to have higher scores in social-awareness and prosocial behavior and the total score of the questionnaire. In adolescents, girls had higher scores in social-awareness and prosocial behavior, responsible decision-making, and the total score. In adolescents, boys had higher scores in self-awareness and motivation. These results are in line with other studies on social and emotional competencies which showed that boys use more emotional suppression then girls (Gómez-Ortiz, Romera, Ortega-Ruiz, Cabello, & Fernández-Berrocal, 2016). Previous studies also found that adult women scored higher than men in emotional intelligence but this difference almost disappeared when age was controlled (Fernández-Berrocal, Cabello, Castillo, & Ex-tremera, 2012). The current study showed gender differences in some variables, mostly related to social competence, but future studies could be useful to clarify these differences. As expected, significant negative relationships were found among social and emotional competencies and two aspects of alexithymia - namely difficulty in expressing and identifying emotions. Positive relationships were found between social and emotional competencies and perceived emotional intelligence. These findings are in line with previous research that showed significant negative, moderate to strong correlations between alexithymia and emotional intelligence (Parker, Taylor, & Bagby, 2001; Velasco, Fernández, Páez, & Campos, 2006), and with studies that showed positive relations between emotional intelligence and the quality of interpersonal relationships (Elipe, Mora-Merchán, Ortega-Ruiz, & Casas, 2015; Elipe, Ortega, Hunter, & Del Rey, 2012). Thus, the SEC-Q shows good concurrent validity. The Social and Emotional Competencies Questionnaire designed and validated in the current study showed good psychometric properties and concurrent validity. Limitations of this study are mostly related to the use of self-reports that measure self-perceived social and emotional competencies. It is possible that the actual level in these competencies differs from their self-perception. Given that the sample of young adults (university students) was selected through convenience sampling, there were more women than men. Thus, new studies with different samples would also be useful. This study also has some very important strengths such as a strong theoretical background, an analysis of the structure of the questionnaire in four different sub-samples and an inclusion of a representative sample of adolescents. All in all, this is a very good tool that can be used in clinical and educational settings. This instrument can also be very useful when evaluating programs for social and emotional learning. Future studies could focus on the relationships between social and emotional competencies and quality of interpersonal relationships, including different age groups and antisocial behaviors such as bullying or cyberbullying. The current work was supported by a research grant for the project "Addiction to the new technologies: The role of cyber emotional competencies and emotional intelligence" (BIL/14/S2/163) granted to the first author and the team by the MAPFRE Foundation. It was also supported by the project "E-Intelligence: risks and opportunities of the emotional competencies expressed online" (PSI2015-64114-R) granted to the first author and the research team by the Spanish Ministry of Economy and Competitiveness within the I+D+I 2015 National Program for Research Aimed at the Challenges of the Society (RETOS) and the project PRY040/14 granted to Dr. Eva M. Romera by the Andalusian Studies Center.